Energy customers need to be in control of their energy consumption and purchasing decisions. The electric system has been overly dependent on governments and utilities to determine prices and costs. This mindset has, over time, left customers as price-takers. Giving customers greater control over their own energy use and procurement will restore greater balance in the system. Energy customers need good and timely access to their data. With control comes responsibility and accountability. To effectively manage their energy consumption and costs, customers need to easily make sense of their utility bills. With knowledge comes the ability to act. Market price signals give customers needed information. Reliable price signals help customers make informed decisions. A well-designed, competitive retail energy market provides the best way to discover true prices. Energy markets have been moving in this direction for some time. The provincial government should not slip back into the top-down regulatory price-setting of the past. Smaller businesses should no longer be disadvantaged in the Class A and B Global Adjustment program. This will be easier to do when the three principles above are followed. Ontario’s energy system must be trusted. Timely, ongoing investments are needed to ensure power quality, reliability and supply. 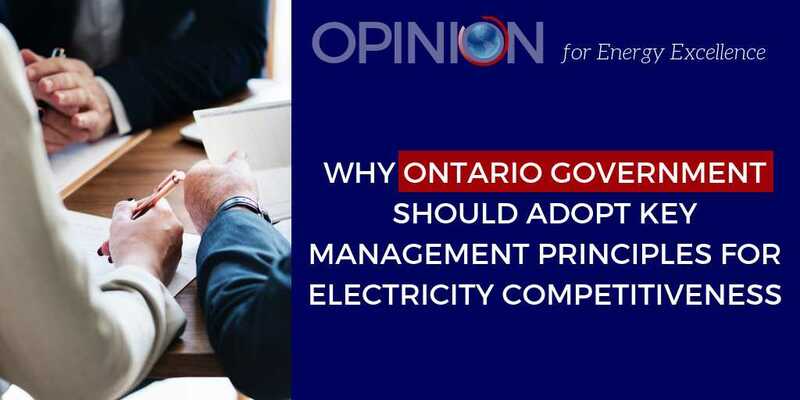 Energy policy should reinforce the competitive advantages of Ontario’s clean grid. The risks of global climate disruption are driving a transition to conservation and renewable energy across the globe. Ontario’s clean electricity grid is a North American competitive advantage. Any new energy direction for Ontario should recognize and build upon this formidable strength. Alleviating price pain points with single “one-off” actions could have unintended and unwanted consequences. Nothing is gained by transferring pain from one set of customers to another. Improving Ontario’s energy systems could be tricky. A principled, holistic energy management approach that focuses on customers can show the way.